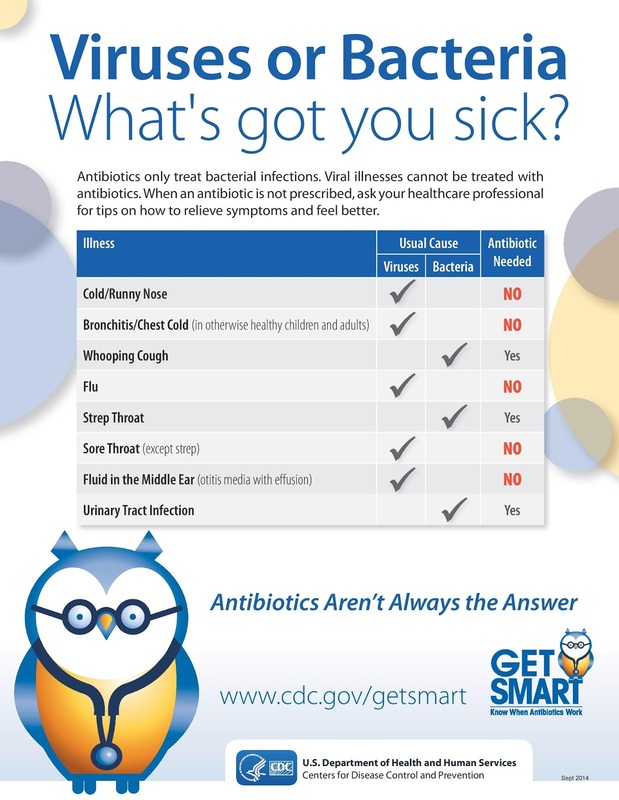 This week is Get Smart About Antibiotics Week, and Texas physicians are raising awareness of appropriate antibiotic use. Antibiotics can’t fight viruses, so taking them for colds, flu, most sore throats, bronchitis, and many sinus and ear infections won’t help you get better. In fact, taking antibiotics when you have a viral infection can actually cause more harm than good, because it increases your risk of getting an antibiotic-resistant infection later. Additionally, there are healthy bacteria in your gut that help break down nutrients for you to absorb. Taking antibiotics when it isn’t called for kills off some of these good bacteria, allowing harmful bacteria to grow in their place. The Centers for Disease Control and Prevention created this helpful chart identifying which diseases can be fought successfully with antibiotics ― and which ones can’t.